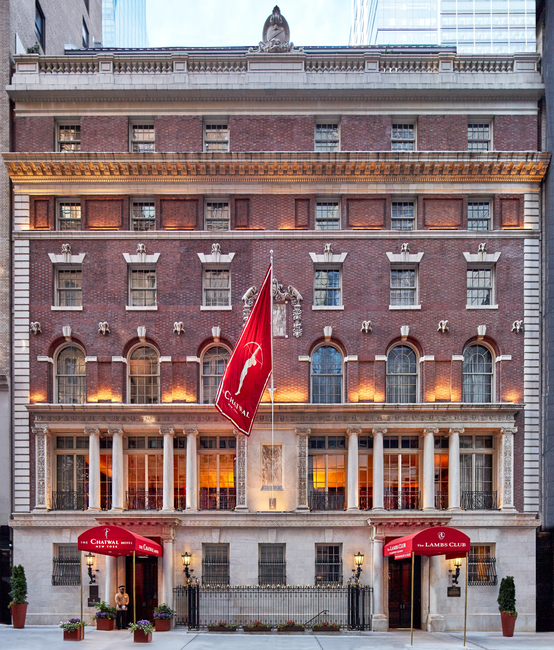 Before becoming The Chatwal New York and The Lambs Club Restaurant and Bar, this iconic Stanford White-designed building was the epicenter of American for the 20th century. The building originally opened in 1905 as home to the prestigious Lambs, America's first professional theatrical club. Organized in 1874 by a group of actors and enthusiasts, The Lambs occupied a series of rented quarters before settling at 44th Street. The American club took their name from a similar group in London, which flourished from 1869-1879, in the name of drama critic and essayist Charles Lamb. Stanford White, a partner at prominent architectural firm McKim, Mead, and White, was the original architect of The Lambs clubhouse. His design principles embodied the "American Renaissance," as seen in his work on summer homes for the Astor and Vanderbilt families and such formidable structures as The Washington Square Arch, Madison Square Garden and the New York Herald Building. For The Lambs, he designed a six-story, neo-Georgian brick building featuring a facade ornamented with ram heads. A boisterous grill room and billiard room were on the first floor, a banquet hall on the second floor and a theater on the third floor. The top floors provided space for offices and sleeping quarters, often utilized by members traveling to The Great White Way from Hollywood. The size of the building was doubled in 1915 when an addition was constructed on the west end of the building, a virtual copy of the original. In 1974, the building was designated a landmark by the New York City Landmarks and Preservation Commission. Since the club's founding, there have been more than 6,000 Lambs, with an elite roster reading like a Who's Who of American theater and film: Maurice, Lionel and John Barrymore, Irving Berlin, Cecil B. DeMille, David Belasco, Charlie Chaplin, George M. Cohan, Douglas Fairbanks, John Wayne, Richard Rodgers, Oscar Hammerstein II, Spencer Tracy and Fred Astaire, who was famously quoted as stating, "When I was made a Lamb, I felt I had been knighted."